There is no sense of urgency to do something different. We feel like we have a lot of time left. But if I told you, you only have another year, would you still be doing what you’re doing? If you live a life with purpose, you wouldn’t have any regrets. I hope you guys enjoyed the quote challenge! I’ve read this book too, finding it meaningful and philosophical. Every now and then we should be reminded of this quote because life is finite and as you’ve mentioned, live with purpose! I like one thing Albom said in the book. It was that death ends a life, not a relationship. I think that’s exactly right. We lose people we love when they die, but we only lose them physically, we still have the love and the warmth from them long after they’re gone. I think, when considering how to live with a expiration day in mind, it’s worth remembering that who we truly are lives long after we do. Thanks for commenting!! I totally agree with you. Thanks for sharing! I love his other book “The Five People You Meet In Heaven”! 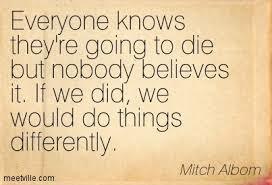 Tuesdays with Morrie is very good too! You should read it, Ambi. :). Cheers! To not taking things for granted!! !